Getting By or Nailing It? Ready vocabulary blocks are mini dictionaries for anyone who wants to master their English to the degree of a native tongue. 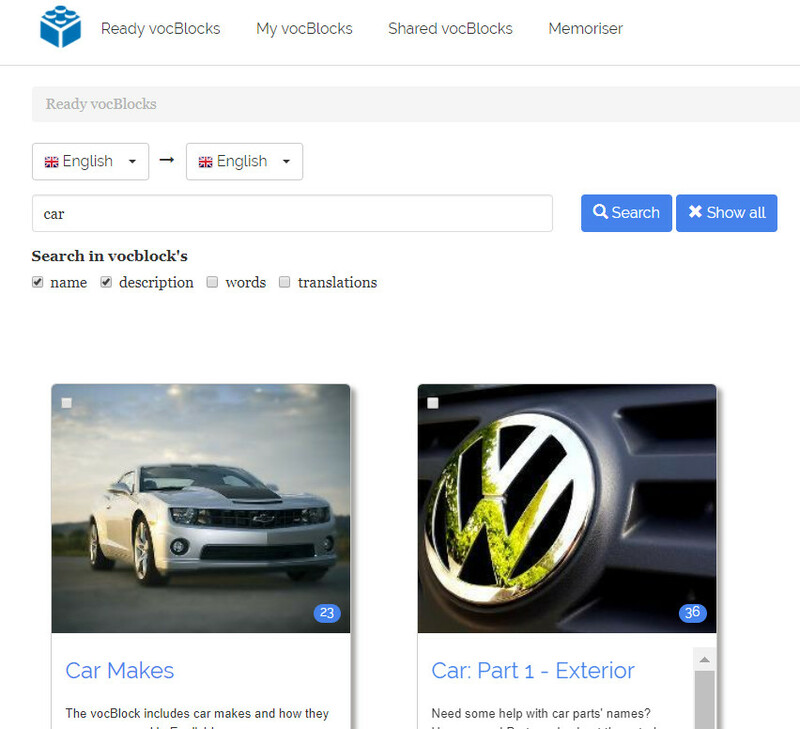 Ready vocBlocks are organised by topic and ready for you to learn. The topics covered are relevant to everyday life and include, for example, your house, your car, nature, the food you eat, travelling, DIY, gardening etc. This is the detailed vocabulary you won’t find in textbooks but these are the words all native speakers know and use. Ready vocBlocks are not for those who have just started learning English. When you start learning a foreign language, you don’t need detailed vocabulary. 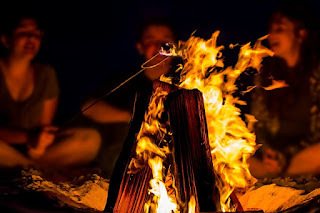 You are in a survival mode where you need to be able to communicate on a basic level with limited means. Once you have progressed to the intermediate level, you feel that you have done a lot. And this is true! You are able to understand and speak your target language and it feels amazing! That’s when you might sit back and relax. Or choose to expand your vocabulary even further. With the English language, most people would choose the latter and grow their vocabulary further. It’s for one simple reason: English is not just a foreign language, it’s the language of international communication. And with the Internet today this international communication, as well as the vast repository of data available in English, is just a click away from you, so intermediate level might not be enough. Ready vocBlocks are there for you to help you expand your English vocabulary further or, if you are an advanced learner, to help you fill in any gaps you might have. For example, if you are killing it at business meetings held in English but are stuck for words for small talk around your weekend plans or if you get lost in a loud banter at the bar with your friends speaking English, you might want to brush up some words every English native speaker (and a lot of advanced non-native speakers!) knows. After all, it’s informal interactions that help you build rapport and gain trust of your international business partners and friends. The words you might not know and that are known to the native English speakers from their childhood are things you can find in your house, school and office; the food you eat; animals, birds and trees you see around and even zodiac signs your friends mention in their convos. Many advanced non-native speakers know most of these words too. You can obviously be quite fluent in English without many of these words, but if you are not content with just getting by and want to really understand and speak the language of international communication like a native speaker, to comfortably interact with both native and non-native speakers on a higher (or should I say deeper) level, Ready vocBlocks will do you a ton of good. You will start noticing these words everywhere once you have learnt them. And what once was just some obscure bits of conversations you totally missed out on, will start making sense. And, on a side note, there are hidden benefits any knowledge can bring you (check out the nerd style posts in our blog to learn more). So, if you feel that Ready vocBlocks are for you, read on! A quick guide on how to use Ready vocBlocks is next. - vocBlocks illustrated with example sentences. The vocBlocks illustrated with pictures include nouns and verbs which are easier to learn with the help of visual aids. For example, fruit and vegetables, body parts, insects, DIY tools and verbs, etc. Some picture vocBlocks offer you to further expand your vocabulary based on the words you already know. For example, the vocBlock ‘Countries and Nationalities’ is aimed at learning nationalities based on the knowledge of the names of the countries, like in the pair of words ‘Argentina-Argentinian’. 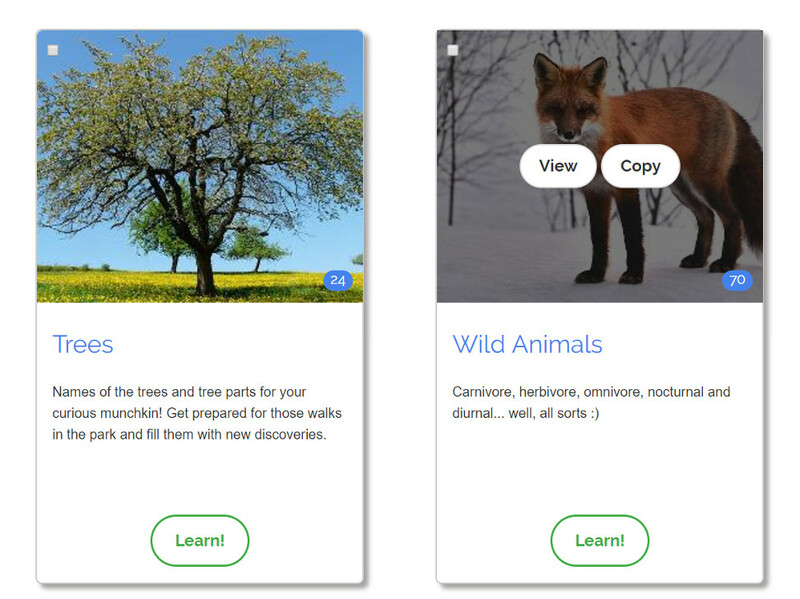 Another example is the vocBlock ‘Animals and their Babies’ aimed at learning the names of the animal babies based on the knowledge of the names of the animals, like in the pair of words ‘horse - foal’. 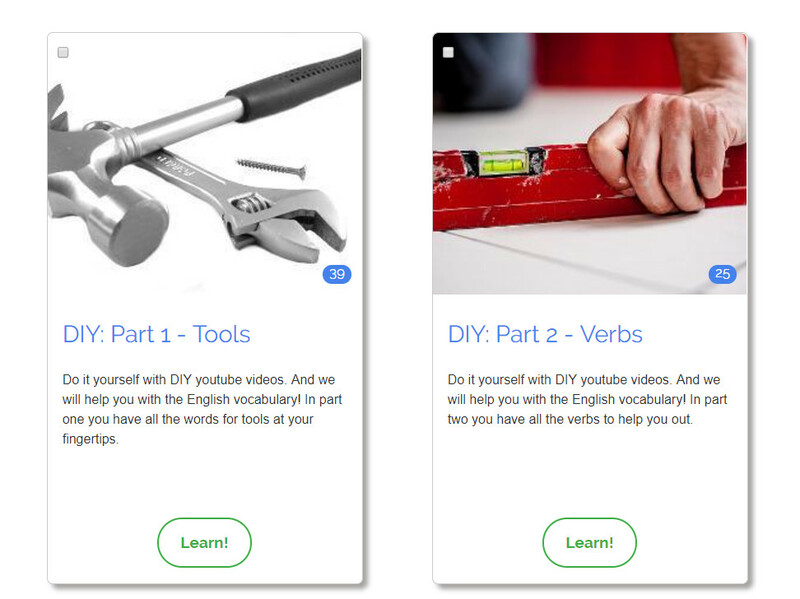 With picture vocBlocks you learn words by doing two types of exercises. The first type is choosing a correct word for the shown picture from the given variants and the second type is typing the relevant word for the picture. 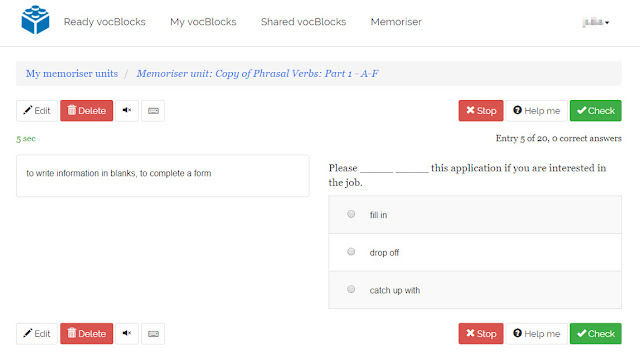 The vocBlocks illustrated with example sentences include verbs which are learnt more effectively in context. For example, irregular verbs and phrasal verbs. and second type of exercises, a more difficult one, is filling in the gap (or gaps) in the sentence with a correct verb. All verbs have definitions or synonyms that help you understand and remember their meaning. These context based vocBlocks also help you practise your grammar, i.e. use of tenses, voice and mood of the verbs. Ready vocBlocks with pictures can be used with translation or without it. Most of the picture vocBlocks are translated into French, German, Russian and Spanish. 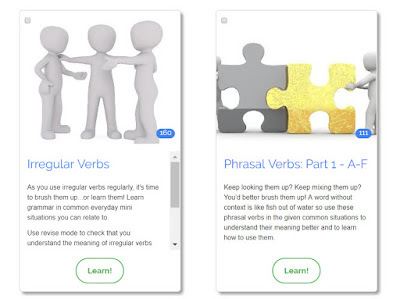 If you choose vocBlocks with translation, the learning stage will include two types of exercises each with two directions Word-Translation and Translation-Word. So, first, you will need to choose a correct translation for the word, then type translation, then choose a correct word in English based on its translation and finally type the word in English based on its translation. 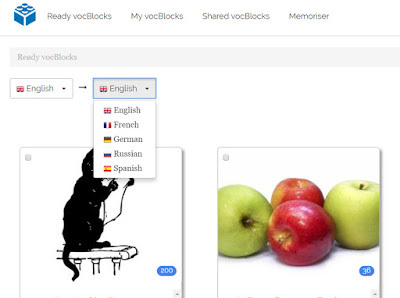 If you feel that you would like to include your native language in the learning process and that you need more time learning these words, you need to choose the vocBlocks with translation. 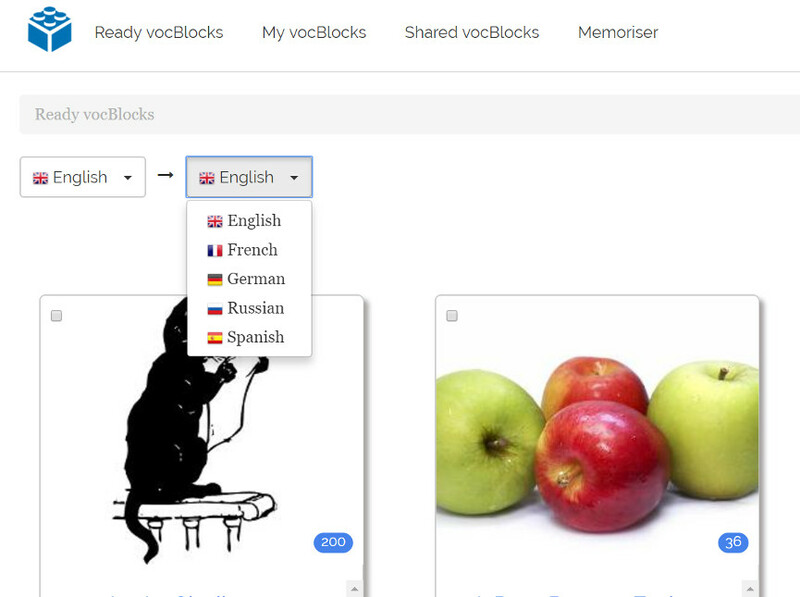 vocBlocks with translation are also useful if you are learning your second foreign language and would like to boost your English at the same time. In this case, however, you might want to customise the audio for these vocBlocks and record the words in your target second foreign language. If you would like to bypass your native language, then picture dictionaries without translation are the ones you need. In this case, you will need to choose the English language from the languages drop-down menu. There will be two types of exercises: choosing a correct word for the picture from the given variants and typing in a word for the shown picture. Bypassing your native language is preferable if you don’t need to practise your translation skills and just need to understand and construct sentences in English. If you have a particular topic in mind on which you would like to expand your vocabulary, you can quickly find this topic or words related to it using search field for Ready vocBlocks. 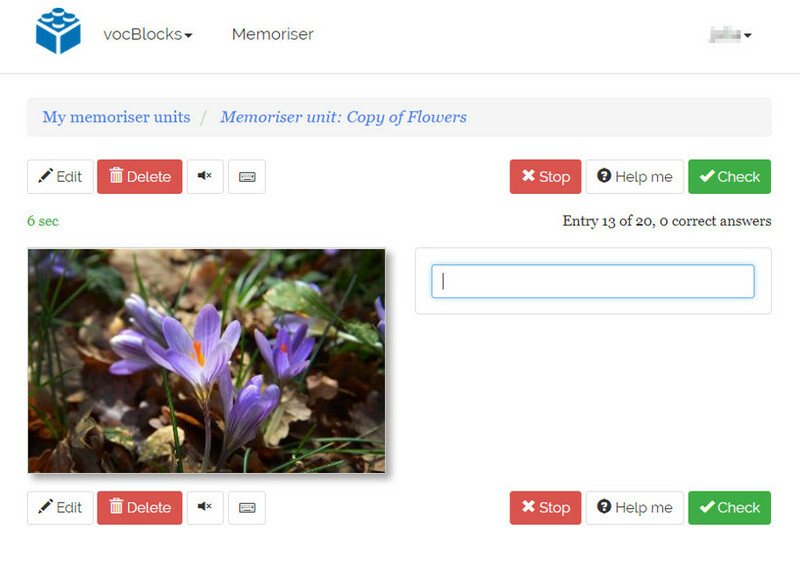 Once you have chosen a Ready vocBlock, you can either send it to your Memoriser for learning or edit it first. For learning, you will need to click the ‘Learn’ button. 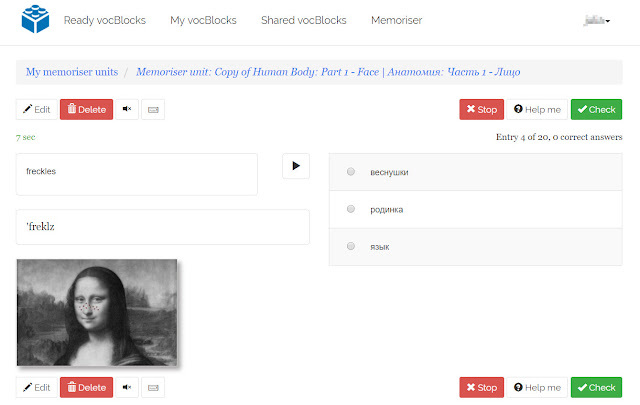 For editing, you will need to click the ‘Copy’ button to create a copy of this vocBlock in the section ‘My vocBlocks’. Please note, that once you click the ‘Learn’ button, a copy of this vocBlock will be created in ‘My vocBlocks’ automatically. We hope that you find this short guide on Ready vocBlocks useful. But if we have missed anything or you have a question please do not hesitate to drop us a line.